JNU students, who were protesting at Vasant Kunj police station demanding arrest of professor Ajit Johri alleging sexual harassment last evening have crossed all limits of basic human decency. A Delhi resident, Nikita Sara Singh, took to Facebook to describe the incident where she saw an injured child bleeding profusely, his mother screaming for help, people around trying their best to help the bleeding child get out of the jam and to the hospital. 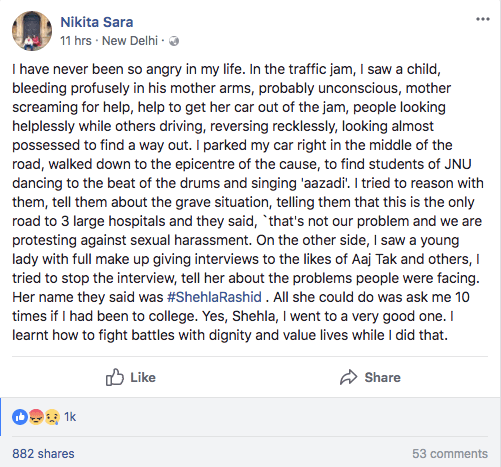 She says that when she parked her car and walked over where the ruckus was, she found JNU’s protestors ‘dancing’ to the beat of the drums, chanting azaadi slogans. She alleges that JNU protestors, who had gone to Vasant Kunj Police Station to protest demanding arrest of Professor Atul Johri, showed their lack of empathy towards the bleeding child by saying the bleeding child isn’t their problem since they are protesting against sexual harassment. She claims she found Shehla Rashid, part time student and full time bully, in an interview with ‘the likes of Aaj Tak’ but Shehla did not care about the issue. According to Nikita, Shehla kept asking her if she has ever been to a college, perhaps because Shehla herself doesn’t believe in attending one. 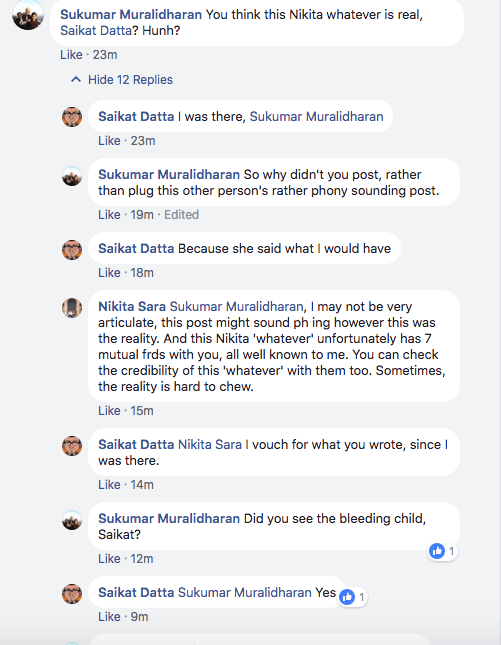 Soon, Nikita’s post went viral, and instead of introspecting and thinking about their actions leading to delay in taking a bleeding child to a hospital, people came doubting Nikita’s experience, some even went to the extent of doubting Nikita’s existence. Shehla sympathiser, who found the thought of bleeding child caught in traffic jam ‘pro government’. 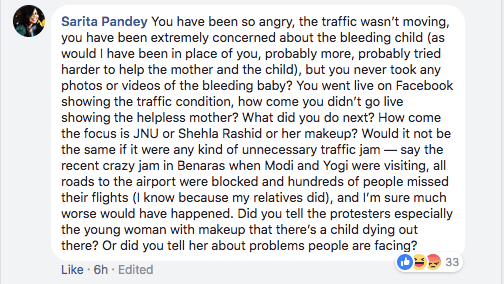 According to Facebook, the lady above is a lawyer in Allahabad Court, and she thinks calling out the protestors for their lack of empathy towards a bleeding child is ‘pro government’. 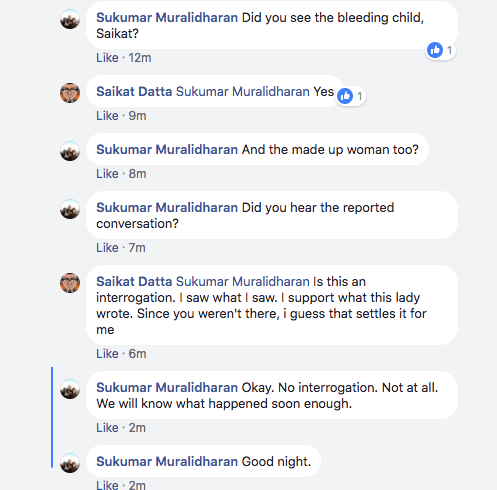 The post was also shared by Saikat Datta, a journalist with Asia Times, former editor of Hindustan Times, who as per his claims was also in the same jam, and he saw the bleeding child too. 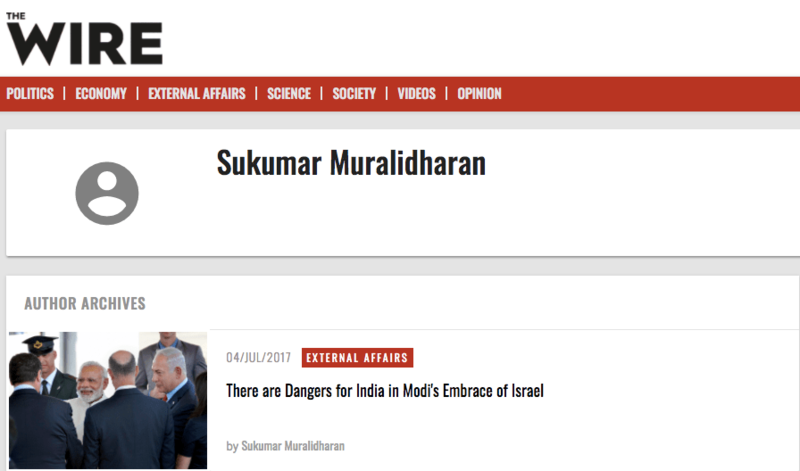 Sukumar Muralidharan is also a ‘journalist’ who contributes to leftist propaganda website The Wire. There were others who doubted Nikita’s legitimacy as well. For example, comrade Noor Zaheer, who probably was not even present at the venue, pronounced that this story is fake. And how dare Nikita not take picture of a bleeding child? How dare she deprive the ‘Internet Liberals’ of pictures of bleeding child? Please note the condescending sarcasm in the post because how dare an injured child bleed when patron saints of protests are doing their work in middle of the road? 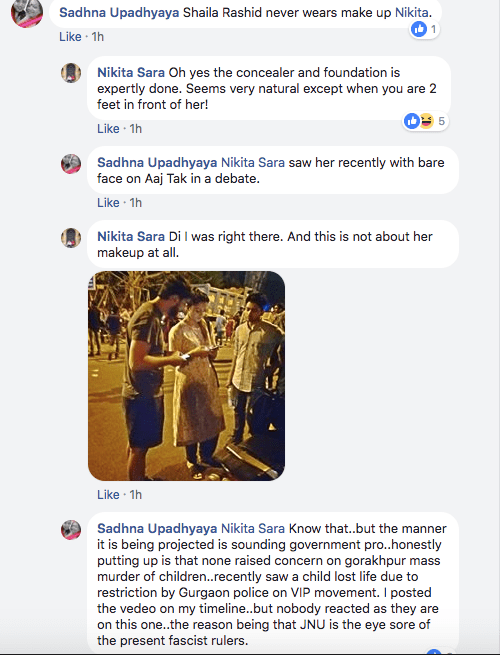 Pro-AAP reporter, Ashutosh Mishra, too, validates the claim of Nikita, saying that Nikita did approach him while he was interviewing protestors, and she was baffled and furious, and since she did not mention a bleeding child and didn’t even show interest in coming on TV for an interview herself, Nikita clearly loses the credibility. Other so-called journalists also started doubting Nikita’s story, which has also been validated by one of their own, because how dare she not put up a follow up post? And clearly, she ‘made up the story’ because she was caught in traffic jam. THIS IS NOT HOW SOMEONE WOULD REACT TO A MEDICAL EMERGENCY. Policemen are standing there, she could have gone to them. Ashutosh had a word with her, she could have told him. https://t.co/T3c25w7tbW None of this happened, but she wanted to KILL THE STUDENTS. Columnist with Shekhar Gupta’s website who wished death upon Modi, also had her thoughts on this and of course, Nikita is lying. Too bad Nikita didn’t pass the muster. Because how dare you not behave in a way these people think is appropriate in times of emergency? Clearly, you have an ulterior motive, or even worse, a Modi agent. 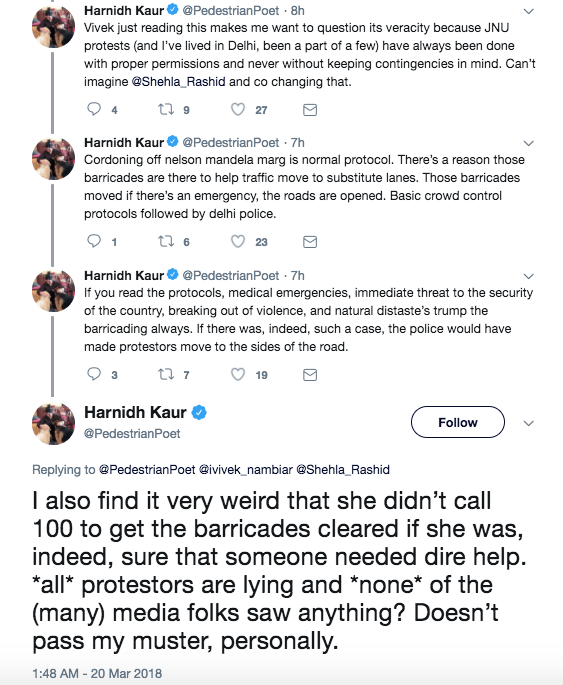 Speaking of being a Modi agent, Shehla Rashid, who’d rather give interviews than ask her minions to clear the traffic jam to take a bleeding child to hospital, has defended herself and claimed the ‘public sympathy’ was created to divert attention. How dare an injured child come bleeding just where we are protesting? Clearly, he is sent by the state and intelligence machinery to defame the movement. Honestly, at this point, I am just tired. Tired that we have come down to this level, this lack of empathy and basic human decency. I cannot believe people’s hate for Modi is so deeply ingrained that they are willing to advocate that an injured child, bleeding profusely, has delay in getting medical attention because of protests, just because the protests are carried out by those who are very vocally against Modi and the government. And what movement against sexual harassment are they talking about? Their double standards, yes, the same set of people protesting and supporting the protests, are out for all to see. When a list of alleged sexual predators in academicia came out last year, ‘feminists’, most of whom were associated with JNU and this movement, said a ‘due process’ should be followed instead of ‘naming and shaming’ the predators. I am seething with rage. It really isn’t that hard to be a decent human being.